Sustainability • Solar energy will help power the new $125M Public Safety Building. 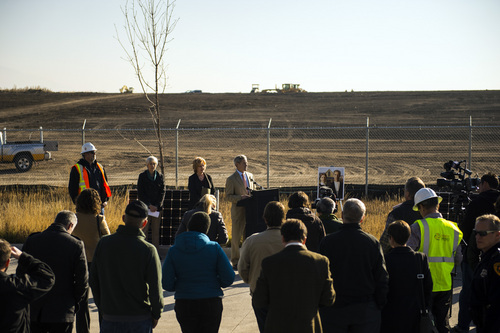 Chris Detrick | The Salt Lake Tribune Salt Lake City Mayor Ralph Becker speaks during a ground-breaking ceremony on a solar farm in Salt Lake City Tuesday November 26, 2013. On completion, the solar array will produce 1 megawatt of renewable energy from 3,000 panels covering roughly four acres. The project was financed as part of the publicly approved new Public Safety Building and will help that facility achieve a net zero energy rating. 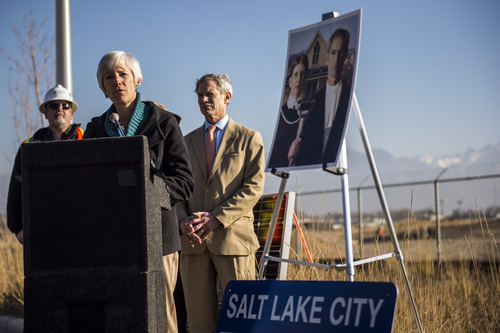 Chris Detrick | The Salt Lake Tribune Salt Lake City Sustainability Director Vicki Bennett speaks during a ground-breaking ceremony on a solar farm in Salt Lake City Tuesday November 26, 2013. On completion, the solar array will produce 1 megawatt of renewable energy from 3,000 panels covering roughly four acres. The project was financed as part of the publicly approved new Public Safety Building and will help that facility achieve a net zero energy rating. 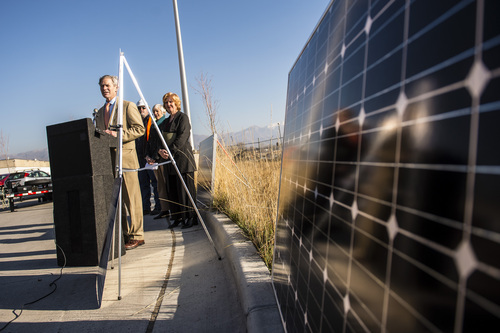 Chris Detrick | The Salt Lake Tribune Salt Lake City Mayor Ralph Becker speaks during a ground-breaking ceremony on a solar farm in Salt Lake City Tuesday November 26, 2013. On completion, the solar array will produce 1 megawatt of renewable energy from 3,000 panels covering roughly four acres. The project was financed as part of the publicly approved new Public Safety Building and will help that facility achieve a net zero energy rating. 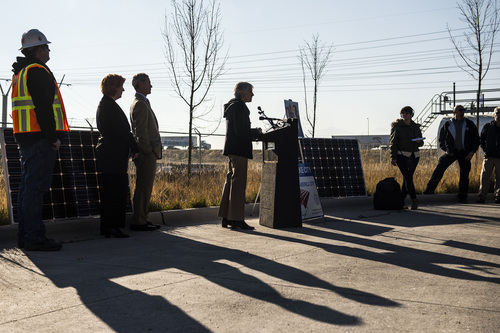 Chris Detrick | The Salt Lake Tribune Salt Lake City Sustainability Director Vicki Bennett speaks during a ground-breaking ceremony on a solar farm in Salt Lake City Tuesday November 26, 2013. On completion, the solar array will produce 1 megawatt of renewable energy from 3,000 panels covering roughly four acres. The project was financed as part of the publicly approved new Public Safety Building and will help that facility achieve a net zero energy rating. 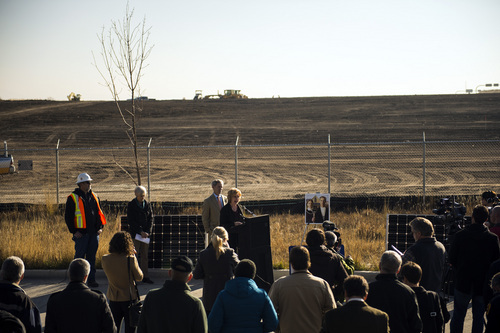 Chris Detrick | The Salt Lake Tribune Councilwoman Jill Remington Love speaks during a ground-breaking ceremony on a solar farm in Salt Lake City Tuesday November 26, 2013. On completion, the solar array will produce 1 megawatt of renewable energy from 3,000 panels covering roughly four acres. The project was financed as part of the publicly approved new Public Safety Building and will help that facility achieve a net zero energy rating. Chris Detrick | The Salt Lake Tribune A solar panel near the site of a future solar farm in Salt Lake City Tuesday November 26, 2013. On completion, the solar array will produce 1 megawatt of renewable energy from 3,000 panels covering roughly four acres. The project was financed as part of the publicly approved new Public Safety Building and will help that facility achieve a net zero energy rating. Chris Detrick | The Salt Lake Tribune Salt Lake City Mayor Ralph Becker speaks during a ground-breaking ceremony on a solar farm in Salt Lake City Tuesday November 26, 2013. On completion, the solar array will produce 1 megawatt of renewable energy from 3,000 panels covering roughly four acres. The project was financed as part of the publicly approved new Public Safety Building and will help that facility achieve a net zero energy rating. 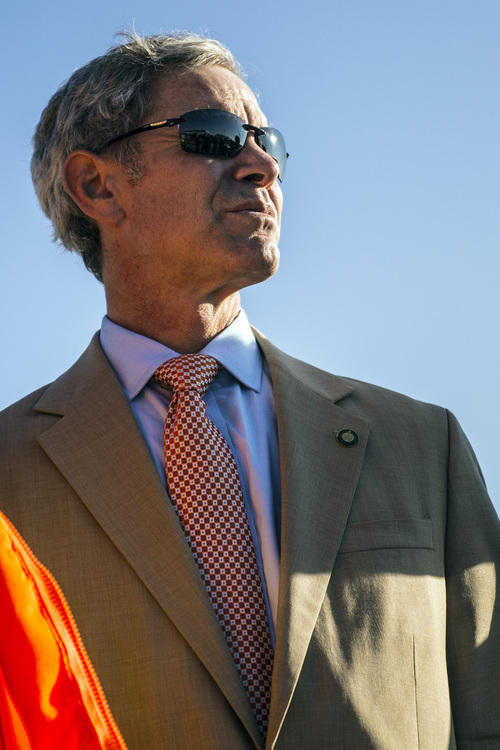 Chris Detrick | The Salt Lake Tribune Salt Lake City Mayor Ralph Becker speaks during a ground-breaking ceremony on a solar farm in Salt Lake City Tuesday November 26, 2013. On completion, the solar array will produce 1 megawatt of renewable energy from 3,000 panels covering roughly four acres. The project was financed as part of the publicly approved new Public Safety Building and will help that facility achieve a net zero energy rating. Chris Detrick | The Salt Lake Tribune Salt Lake City Mayor Ralph Becker speaks during a ground-breaking ceremony on a solar farm in Salt Lake City Tuesday November 26, 2013. On completion, the solar array will produce 1 megawatt of renewable energy from 3,000 panels covering roughly four acres. The project was financed as part of the publicly approved new Public Safety Building and will help that facility achieve a net zero energy rating. 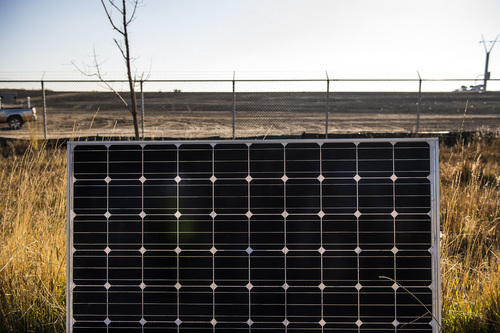 Salt Lake City announced Tuesday it will build a solar farm that will increase by tenfold the municipality&apos;s ability to create energy from the sun. The four-acre facility at 1955 W. 500 South should go online by late winter or early spring. 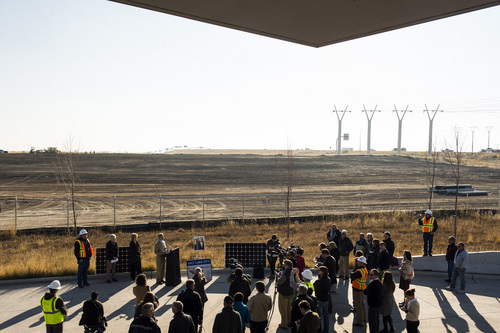 At a brief ceremony Tuesday, city officials said it would produce 1,000 kilowatts  or 1 megawatt  the energy equivalent to power about 150 homes for a year. The $3 million farm is to be constructed on a former four-acre landfill site that would be cost prohibitive for other types of development because it would require excavation. The solar project will pay for itself in 10 years, said Vicki Bennett, the city&apos;s sustainability director. After that, the energy created by the facility will be free, except for maintenance costs. 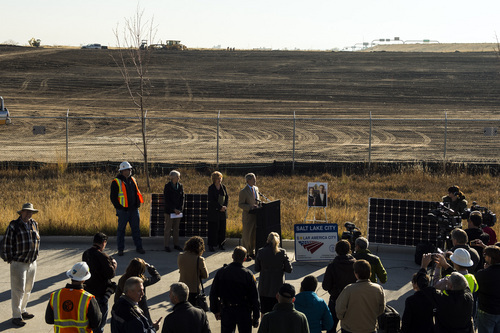 The solar farm will help power the new $125 million Public Safety Building, Bennett said. The building, which opened earlier this year, had space on its roof for enough solar panels to create about 40 kilowatts. Upon its opening, city officials said the Public Safety Building would be "net-zero"  creating as much energy as it uses. The net zero rating will soon be attained with the addition of the new solar farm, said Mayor Ralph Becker. "We are utilizing a historical landfill  space that cannot be used for traditional development  to harness renewable energy and offset the energy use at the Public Safety Building," Becker said. The energy produced from the farm will save the equivalent of 1,036 tons of carbon emissions into the atmosphere, said Art Anderson of Taylor Electric, the firm that is installing the panels. Bennett, along with City Councilwoman Jill Remington Love, took the occasion to urge residents to consider solar energy for their homes. The cost of solar panels has decreased sharply over the past decade, Love said. And Bennett noted that electricity rates are expected to rise by as much as 6 percent per year.